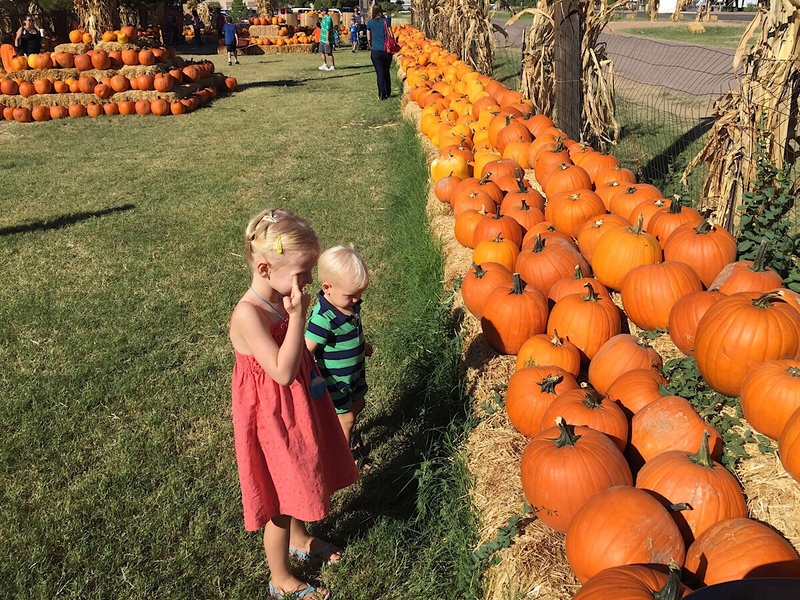 It’s fall, and here’s a list of our favorite pumpkin patches in Phoenix! 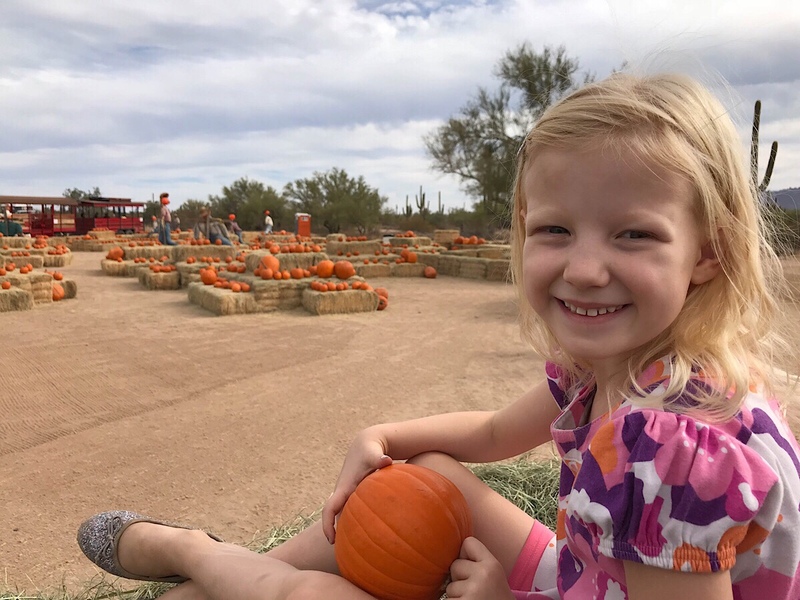 And be sure to scroll to the end of the article to read some thoughts about what pumpkin patch might be best for your family. Open September 29-October 31, 2018. Hours are from 9 am to 6 pm daily Sunday-Saturday, closed Tuesdays. This is the closest pumpkin patch to us and one of our favorites. They have a great petting zoo (just watch the goats – they can get bossy), great games and toys, a fun hayride to the patch to find that perfect pumpkin, and more! General admission is a $10 entrance fee per person on weekdays, $12 per person on Saturdays and Sundays, 23 months and younger can enter for free. Get more details on the MacDonald’s Ranch web site. October 1-31, 2018, 9am-9-pm and 9am-6pm on Halloween. 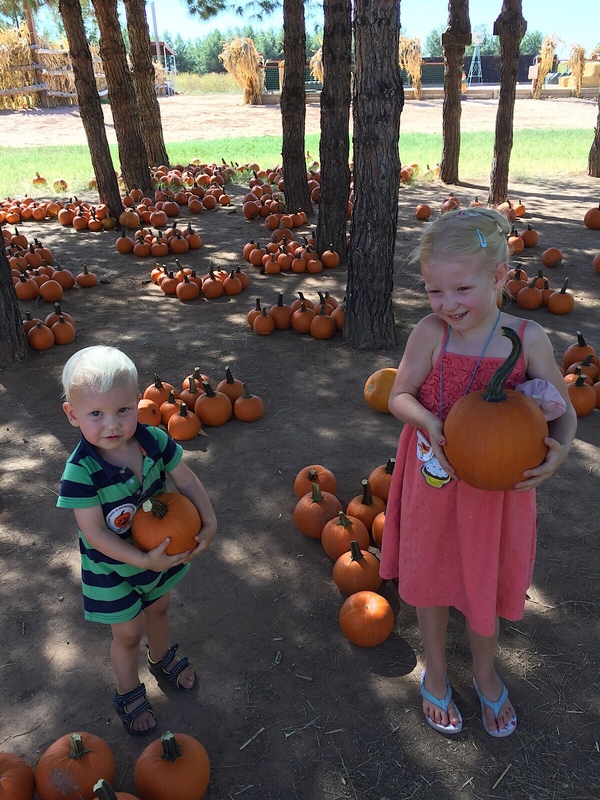 Here’s a great option if you are looking for a pumpkin patch in Gilbert, AZ. The farm entrance fee is $10.00 per child, and includes a small pumpkin, bag of stickers, decorating your pumpkin, the air bounce, a hayride, straw bounce, feeding the animals and a maze. Adults are $5.00 to tag along and ride the hayride. This farm is smaller than most, but our kids loved the space to run around and the darling little pumpkins under the trees. More information can be found on their website! Open Friday-Sunday starting October 6, 2018. Hours vary. 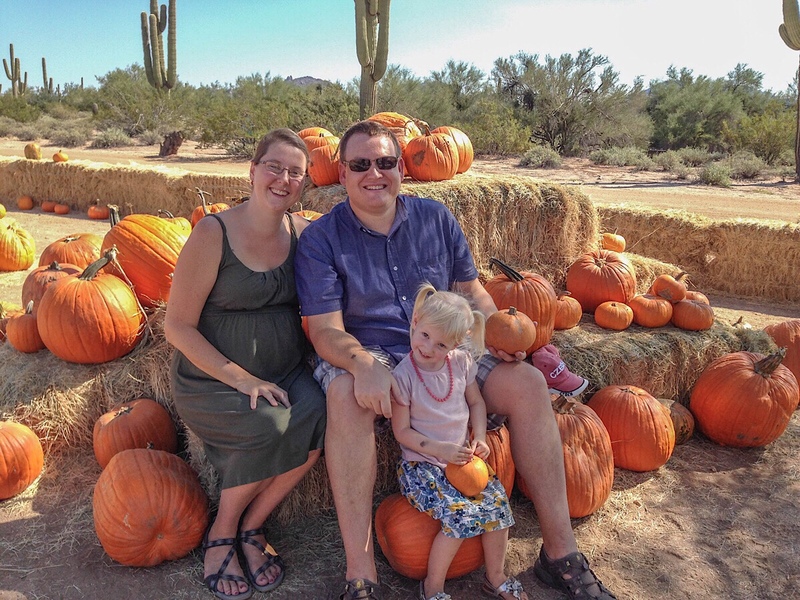 If you are looking for a pumpkin patch in the west valley, consider the Rocker 7 Farm Patch in Buckeye. They have a corn maze, a pumpkin patch, sunflower field, hay rides, and more! You are welcome to bring your own food. Admission is $9 on Friday, $10 on weekends; children in diapers are free. Click here for the details and photos. 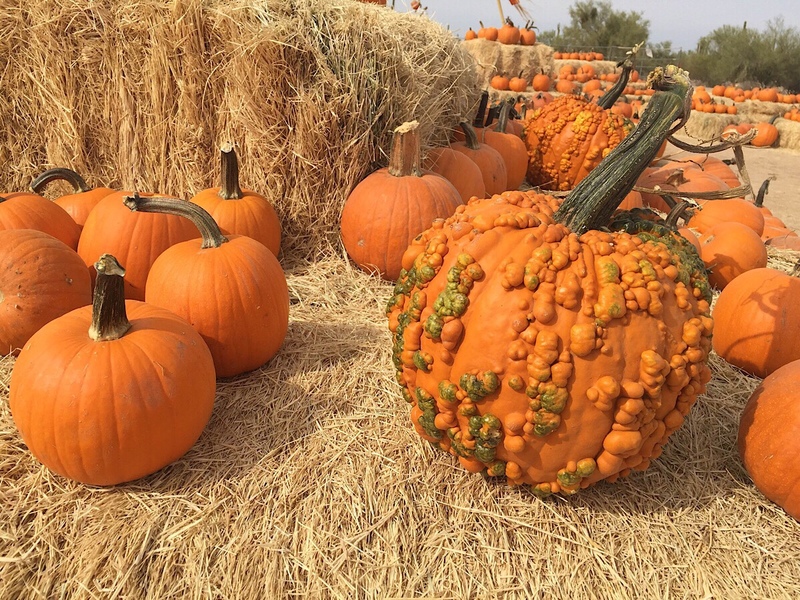 This is a very unique and different type of pumpkin patch: there are detailed carved pumpkins scattered around the walkways and kids will love them! There are no pumpkins for sale, but other activities like a corn maze, a costume contest, face painting and more. We attended this event for the first time last year. It is FREE to wander around and enjoy the pumpkins! Other activities, like the face painting, does cost. See their website for more details. Runs October 1-November 4, 2018; 9am-9pm M-TH, 9am-10pm F-Sat, and 10am-6pm on Sun. This farm was new to us last year and we loved it! Click here to read our summary. They have a corn maze, air playground, giant tube slide, and a bunch of farm animals and bounce houses. All ages are $10/person, 2 and under are free. They also have a season pass for $30 per person, which might be a good value if you plan to revisit. Visit Vertuccio Farms web site for details. October 4-28, 2018. Every Thursday-Sunday, 10am-9pm. 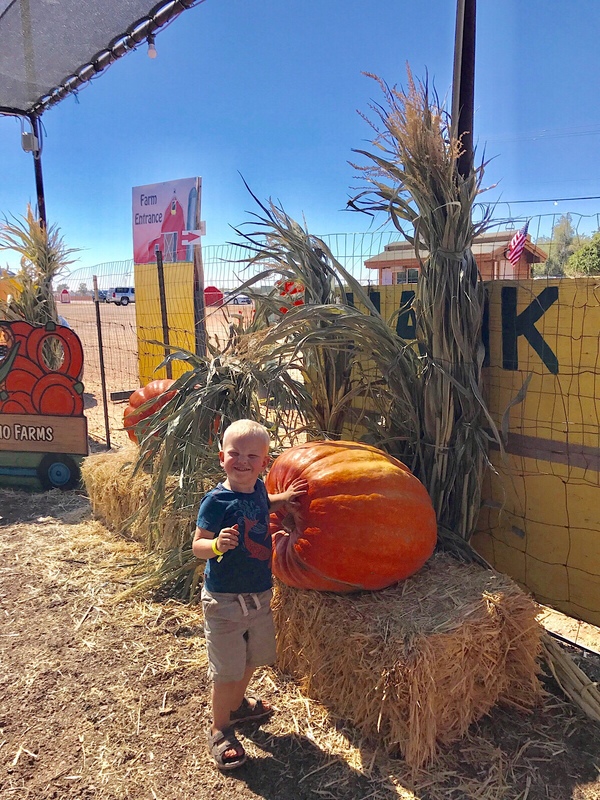 One of the valley’s favorite farms, Schnepf Farms is offering a pumpkin and chili party — and is the ultimate pumpkin patch and family fun destination! Rides, games, shows and more will keep the kids happy all day. Admission $20 plus tax at the gate or $15 at any Fry’s Grocery (children under 2 free). You can get more information at the Schnepf Farms web site. Open September 28-October 4, 2018, Wednesdays-Sundays. Hours Vary. Tolmachoff Farms is another great option on the west side! 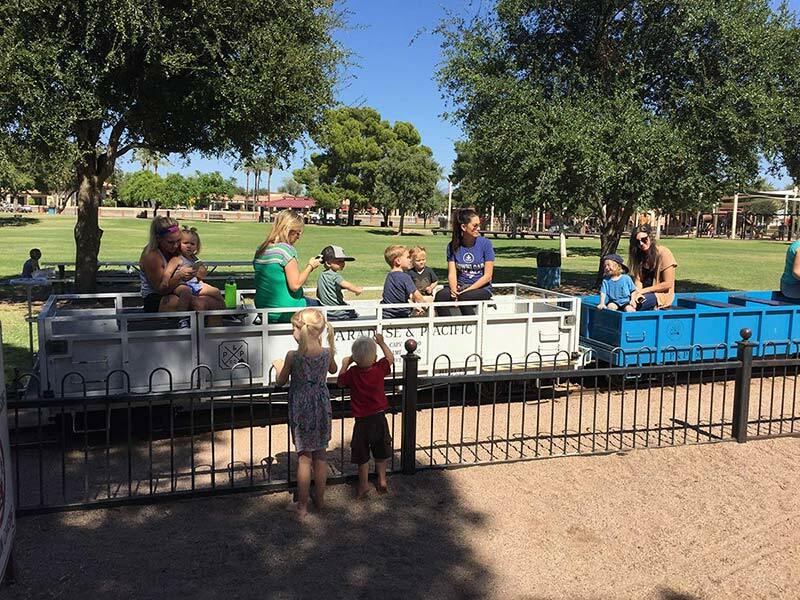 They have a petting zoo, a train ride, a mini corn maze for toddlers, a haunted corn maze, and play areas. 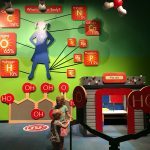 Admission is $12/person, ages 2 and under are free. Extra charges for the train ride. They have a discount coupon available online. Check the Tolachoff Farms web site for details and directions. 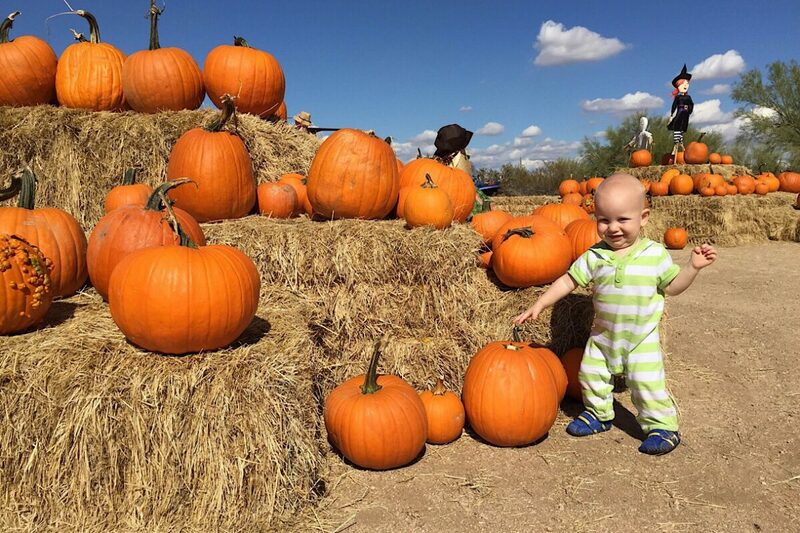 We have been asked by our readers for recommendations on the best pumpkin patch in the Phoenix area. First, which one is closest to you? We recommend checking out that location, for the sake of convenience. (We always go to MacDonald’s Ranch in Scottsdale for this reason!) Make it a weekend family event, or meet up with friends for a playdate. But, also consider the ages of your children. 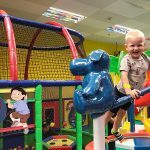 Do you have little ones under 5? Vertuccio Farms or Mother Nature’s Farms might suit your family better. Or, if you live in the West Valley, try Tolmachoff Farms. Schnepf Farms is also fun, and has alot to keep older children and teens occupied, definitely worth the drive. 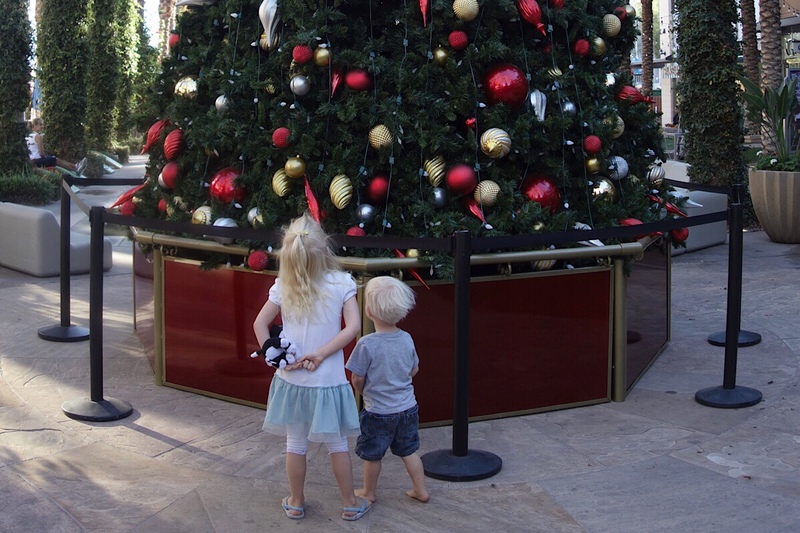 For more ideas about discounted admission to Phoenix attractions, check out our popular article! Pogo Pass Giveaway! Win Two Free Pogo Passes! Enter by September 21, 2014!